I've never really tackled television on here before, apart from a dashed-off defense of The Wire I wrote ages ago (which was also a fairly pointless exercise since if there is a TV show on Earth that doesn't need defending, it's The Wire) because television shows, in general, are so much broader subjects than films. I can sum up my feelings on a film in one 700 word review since it's a single, self-contained entity, but a television series is a much more malleable entity that can have peaks and troughs, and as such an opinion of it as a whole will be too complicated for such a small number of words. However, since there have been few events in the pop culture calendar that have got me so genuinely excited as the return of Doctor Who has, I've decided to start writing about the show on a weekly basis. This will allow me to write more, making up for the rather lax January on this blog, but it'll also give me the opportunity to be a bit looser with my writing, which has become a bit rigid than I would like since I imposed a word limit on my film review writing last year. Anyway, without any further delay, let's dive in and check out the Eleventh Doctor's first adventure, "The Eleventh Hour." "The End of Time," the two-part special which saw David Tennant leave the role he had made his own over his four-year tenure as The Doctor, was a bittersweet experience for me. On the one hand, it was the last we would see of Tennant in a role which he had excelled at. On the other hand, the episode itself was an overlong, cack-handed send-off which was unworthy of either Tennant or the fans who had invested so much in his portrayal of such an iconic character. This was largely down to Russell T. Davies, the head-writer of Doctor Who and the man who, against all the odds, revived the franchise in 2005. Whilst no one can doubt RTD's populist appeal, the writing left something to be desired. Too often, his stories relied on the "a wizard did it" style of science fiction/fantasy writing: No situation was so dire that The Doctor couldn't just wave his sonic screwdriver around, or talk a bunch of technobabble, and it would all be resolved, no matter what the problem was. And, no matter how many times he wiped out all the Darleks, and all the Cybermen, they could always come back for the series finale. Throw in his love of giving the Doctor's Companions annoying families who just kept cropping up in every story, and you've got a combination that could make for some pretty terrible television. So, when RTD announced that he was leaving the show to be replaced by Steven Moffat, I was overjoyed. Moffat, a lifelong Doctor Who fan and creator of popular BBC series Press Gang and Coupling, had been with the show since it returned, and routinely turned in some of the best episodes of the reinvigorated show. His story "Blink," starring Carrey Mulligan and revolving around a twisty narrative about hideous angel statues and time travel, is one of the best hours of science fiction writing I have ever witnessed. And the new Doctor, Matt Smith, whilst a relative unknown, really impressed me in an adaptation of Philip Pullman's "The Ruby in the Smoke" which aired at Christmas 2006. 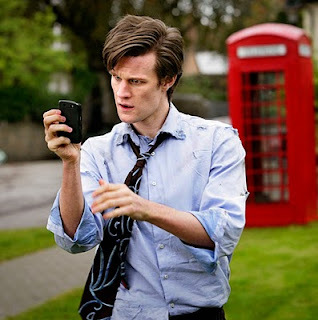 I didn't watch it and think, "Wow, he's going to be Doctor Who someday! ", but when his casting was announced, I wasn't as surprised as many people, and I certainly wasn't as negative as others. I've had high expectations for Moffat's first episode as show-runner and Smith's debut (apart from a bit of post-regeneration shouting at the end of "The End of Time"), and I am pleased to say that it not only matched but exceeded them. First episodes have always proven the trickiest for the show to pull off. Since they tend to follow a long(ish) gap since the Time Lord's last adventure, they need to throw The Doctor into a fun, light little adventure to get things off to a flying start. However, they've also got to introduce whatever the current series arc is (Bad Wolf in Series 1, Torchwood in Series 2 and - judging by the comments made by a possessed Sophie from Peep Show - 'The Silence' in this current run) so they can't be too standalone. But they also can't get too mythological, since Doctor Who is still, at heart, a kid's show and too much, too soon could undo the careful balance of Saturday night light-ents and eerie fairytale that has made the show a perennial favourite. At the same time, Moffat has to introduce a brand new Doctor - who in turn has to follow one of the most popular Doctors in the history of the show -, a new Companion, a new TARDIS, a new theme music and title sequence, and a new cast of supporting characters. All the while delivering an exciting story that will keep the momentum of the show going. Given how much the episode had to do, what's most surprising about it isn't that it manages to do them all, but that it does them effortlessly. Apart from an ill-advised cold open in which the TARDIS is shown hurtling over London with The Doctor holding on for dear life, the episode rarely sets a foot wrong. The Doctor crash lands in the garden of Amelia Pond, a young girl who isn't afraid of anything. Except for the crack in her wall. The Doctor soon discovers that an extra-dimensional being known as Prisoner Zero has escaped from its place of captivity, and is hiding in Amelia's house. Before he can do anything, The TARDIS starts acting up and The Doctor has to fix it. He promised to be back in five minutes but, time travel being so tricky, he actually comes back 12 years later, to discover that the little girl he left behind has grown up to be the lovely - and slightly stalkerish - Amy Pond, played by Karen Gillan. Within that opening 20 minutes, Matt Smith silences all those who doubted he could be the Doctor. He is magnificent. He brings an energy and wit to the role that feels like an extension of the many previous incarnations, but there's a vitality to him that is unique. He seems both the young adventurer, and the old professor. He is, in short, The Doctor. If that wasn't enough, Karen Gillan is a sparky Companion who gives as good as she gets. The scene in which The Doctor realises that he has been away for 12 years and that the woman in the policewoman's outfit standing next to him is Amelia has some crackerjack dialogue as she reveals that she has spent much of her life in therapy because of her insistence on the existence of the Raggedy Doctor who visited her one night, promised to come back and never did. Moffat and Gillan give Amy a real personality, albeit a fractured one, and I hope that the rest of the series makes good use of her. The rest of the episode is good, if a bit on the sillier end of the spectrum. It's one of the many episodes in which The Doctor has to save the entire Earth from being destroyed, and he does so in a way which involves lots of technobabble and Eureka! moments. But I was so excited to see Smith's take on the character that it all felt fresh and new. It isn't one of Moffat's best stories, but he still manages so moments of creepy brilliance, such as having Prisoner Zero disguise itself as a man and a dog but get the voices mixed, creating an Aphex Twin-style moment in which a man angrily barks at our heroes. As an opening episode, it does a great job.